Lower the front of your Bay Bus the easy way, with Dropped Spindles. 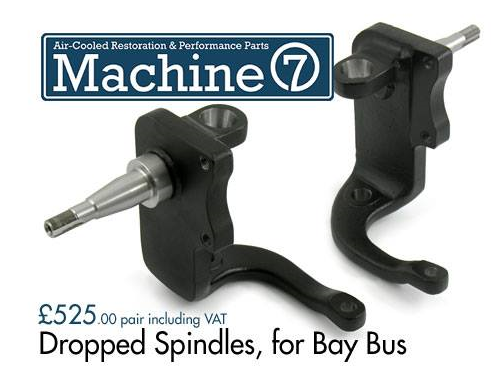 Machine7 now have Bay Bus spindles in stock, 100% new items, not re-manufactured. Instant 6cm drop (2-3/8″), and retain your original Ball Joints, Shock Absorbers etc, for excellent ride quality. Very straightforward installation, as they are a direct replacement for your original spindles. Designed for 73-79 Bay Bus, but can also be used on 68-72 models, if used in conjunction with the later 73-79 disc brakes.